The Garmin Vivofit that I purchased in November has been tracking all of my steps - with the exception of a single day when it stayed on the side table and I stayed in bed. First, you need a few measured loops, simple walking loops where you know the exact distance. At the beginning of the day when the Vivofit picks the target, these numbers are not overly useful. After all, a 9000 step target is not going to be satisfied by any of these. But at the end of the day, when you just need a few steps to meet your goal, having a few pre-measured loops will keep you from wandering the neighborhood like a hobo. Second, comfortable shoes matter. I switch back and forth between a pair of mid-weight hiking boots and a pair of very light-weight running shoes. The running shoes allow for a faster pace, and the extra heel cushioning is terrific. The boots give great ankle support, at the cost of a more jarring stride. I still rotate between the two because I wear the boots when hiking (not on paved roads or sidewalks) so I need to feel their weight and support. But, for the longer loops I try to go with the running shoes. Third, you have to have good music on your MP3 player. Hit "Random" and start walking. I need to work on a strategy for crappy weather. I was able to bundle up (layers) for cold weather down to 32 degrees. But cold and windy and damp are not my favorite combination. Once you get warmed up, the layers start working against you, and any attempt at relief was rewarded with chills. Did I really miss my December target by 315 steps? I need to figure out how to relate to the Garmin Vivofit. Sure, we have come to an agreement on daily targets (the Garmin picks). And, I know that I am going to miss my daily target - my longest streak in 11 days, all during the Christmas and New years Holidays. In fact, I only surpass my target 69% of the time. But, I missed my December monthly target by 315 Steps! The sum of the daily targets for the entire month is recorded and reported. Imagine my surprise and disappointment. In January I had a couple of very busy days and missed my daily target. I have been working to catch up. I have not found a way to reset the daily target - which is randomly picked, but seems to trend higher every few days. My goal requires 8440 steps per day, which is well below the random picks. I don't always have an hour a day to dedicate to the road. This chart shows pace of 1787, 1830, and 1828 steps per 15 minutes. I started tracking my steps with the Garmin Vivofit during the week of November 23. Since Thanksgiving I have lost seven (7) pounds and my blood pressure and HbA1C are back to normal. I have recorded >535,000 steps, with no injuries - not even blisters. It takes me about 2071 steps to cover a mile (my score today: 14,522 steps, 7.01 miles). Aches and pain sure -- because: old and fat. But, I suspect that jogging ~260 miles in 65 days would have been physically traumatic. Injuries limit exercise. Walking is working for me. The Garmin Vivofit is keeping me honest and working hard. After consultation with several experts on Twitter (Jason, Carrie, Amanda and Dane), I took the advice to keep is simple and created the following shooting log to track our family results. 10pt9.com has as Shooters Journal on their site if you want something very formal. My solution (confession, I'm an IT geek) is a spreadsheet with information stored in ranges so that I can pick them quickly. And, to keep it simple, a couple of free-form columns for notes. The columns in YELLOW are list driven (I have to choose from a specific list). This makes the reporting work. The GREEN columns can take any data. For example, I made a note for a session right after Christmas. We shot indoors -- in freezing temps. We could see our breath at the firing line. Why? The range pumps outside air down the lanes in order to keep lead away from the shooters. We also shot archery indoors at Cabela's - with an instructor. I felt this was an important milestone as Tot4 moved from leather glove to a trigger release. For 3P shooting, I'll need to add a column for "Position"
Click on any graphic for a larger image. This report shows Shooter, Firearm, and Rounds. When we added a Nikon scope to our Henry Golden Boy, the scope pointed me to the Nikon Spot On BMT Site. This site provides a calculation of bullet drop to match the reticle in the scope. It is ammo specific - just click a few boxes, and it provides the chart on the right. Just a few hundred rounds using CCI, Remington and Federal proved the tool to be really useful - dead on at 50 and 75 (or 50 and 69+ a bit of fudge). I'm also tracking ammo because of our Sig Sauer Mosquito. More than a few sites and YouTube videos say the Mosquito is prone to jamming with cheap ammo. Several claimed the pistol is a piece of junk. Well, I can confirm that CCI shoots just fine, and that the Mosquito has not shown any major issues with Remington. I have not tried Federal so far. We have the log, we have the commitment to shoot, now we just need to start keeping score. 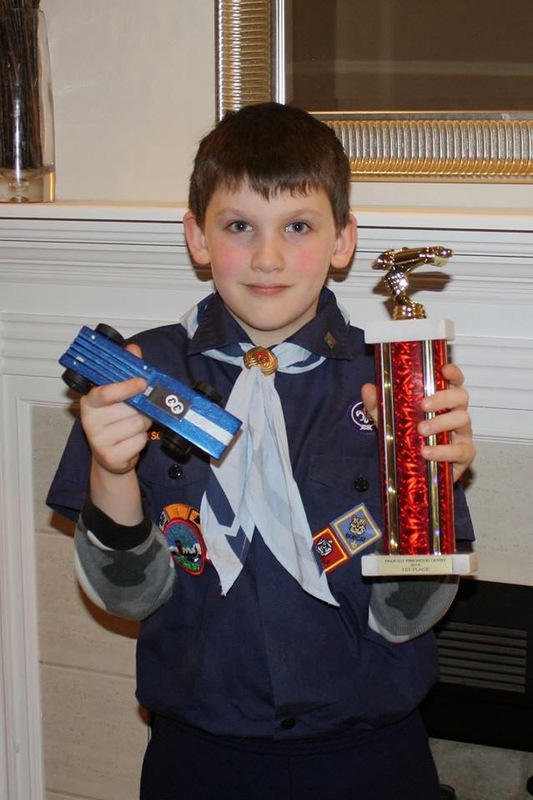 Last spring the boy took first place in in the Pinewood Derby for his Troop. This year we needed to build a new car that will be just as competitive as the old car. Here are the previous posts. We wanted to use a simple shape - to reduce the amount of time in the shop. The troop was really lucky to have access to a workshop with everything needed to convert a block of wood into a racing machine. Our plan was to go to the preparation event with the full design in hand, run the block through the band saw, do a bit of drill work to manage weight placement, sand lightly and walk away. When transferring the design to the side of the pine block, I rotated the block to get a better angle for tracing a pencil line down the edge. We went to the preparation event, did our cut-out, light sanding, weighed in, then walked out. According to plan. At home, we were dry-fitting the weights when we discovered that the large weight would be slightly behind the rear axle. This would not be the optimum placement since the car might pop a wheelie at the bottom of the ramp. On further examination, I had reversed the wheelbase when drawing the line for the cut. OK, so we had to go to the make up session. In order to counter-sink our weights, we used a drill press with a bit that the same diameter as a quarter. Three drill holes on the back of the car, a bit of work with a chisel, and we could slide in a second layer of weights. Based on the preliminary weight-in, it looked like two (2) quarters would do the trick. I do want to build a car and call it 50-cent, but the boy doesn't get the joke. For the make up session we double (triple, quadruple) checked the layout and the wheel-base. We cut the simple form, and then went back to the drill press. Our first build required some chisel work to get the groove size correct - we wanted to skip that additional work. We reset the bit-depth so that the drill would not penetrate all the way through the vehicle then used a bit just slightly larger than a quarter. This round was much easier - squaring out the round corners with a chisel, then flattening the bottom of the groove where the tip of the bit counter-sunk into the pine. Finally, we went over to the belt sander and worked out all of the rough spots. It's amazing how fast you can get all of this done when you know what you are doing. Last year we used Krylon primer and metallic blue paint with silver glitter. This year the boy wants to go au-natural - with no paint at all. Pine and lead... nice. Next week is the formal weight in session. We will have to hand-over the car until after the races are complete. Fingers crossed that we do as well as last year. RazorSocial just posted a blog "How to Use Feedly for Tracking Blogs". I've been a Feedly fan since the demise of Google Reader, and had a popular post in 2011 which outlined how to use Google Reader to follow Twitter hashtags "Google Reader Tames Twitter Stream" and Facebook pages. While Google Reader had the flexibility to track Twitter hashtags, and Facebook pages, it is not clear that Feedly has added this functionality. The "organize" features of Feedly do allow quick sorting/grouping of blog topics. This is a snip showing layout in the left-hand margin for my account. I use four major groups to sort the data, and Feedly show the total number of unread articles (237), and the number of unread items in each group. I read 45 blogs via Feedly, and simply don't know of a faster method to collect and organize my list. Behind the scenes is a drag-and-drop interface for organization. My "A Economists" list is a collection of favorites - which always get first read. The Z-Other Economists still get some of my attention - but time constraints drive priorities. Drag and Drop interface for sorting/grouping your blogs. Feedly did incorporate a new feature into their "Tweet This" functionality. The prior version simply sent the title of the article, a link and a "via Feedly" tag. At the end of 2014 they updated this feature to use hashtags - so "via Feedly" became #Feedly, and, the group name from your organizer is also sent (#xoloandmacro is my group). If you are judicious in your naming convention, you can Tweet messages and links directly to a specific Twitter hashtag. Feedly provides a great blog consolidation platform - with quick collection, organization and reading. It has decent "push" functionality (to Twitter, to OneNote, etc.) but for pulling data it is not as flexible as the deceased Google Reader. Simplify a data pull from Twitter and Facebook and Instagram. Improve your online Help, or create a user community. 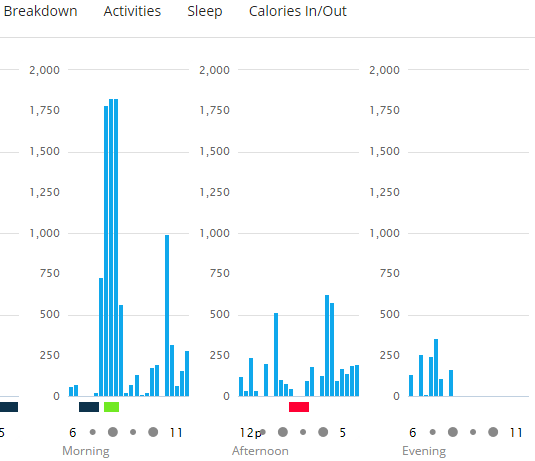 This is an update to my blog: Garmin Vivofit - the First 300,000 Steps. Early in January the Garmin Vivofit web site started having Sync issues. It appears that the Sync problem has been resolved - data is flowing between my device and the web site. But some of the data is not flowing down to the Reporting tables. I have not lost any data, but I did take the step to create an Excel spreadsheet to capture my steps. The Export Function is limited to rolled up values (Weekly or Monthly). It will dump a simple table into a CSV format. To get daily values, you have to look back over & day periods, then mouse-over the columns to read the number of steps. Reports look back from "today". If you review your stats on a Wednesday, the "Week" is Wednesday to Tuesday. Seems like a calendar week (calendar month) would be a better timeframe. Uphill, downhill, flat... no difference. In the end it probably evens out - especially if you are walking loops. Finally had to take the Vivofit module out of the wrist band at wash it... (60 days!). Gunk accumulation was minor, but it's back to new condition now. I'm still a big fan... the Vivofit has motivated me to get off my duff and move. I'm still on track for 2.5 million steps by Thanksgiving, 2015. After two years working at Microsoft my health was pretty poor. Sure, I was really active, but by diet and sleep patterns were a mess. And, to deal with work stress it wasn't unusual for me to grab the chainsaw and garden tools and do several hours of exhausting yard work - just so I could get to sleep. When we moved back to Texas from Seattle I was fully burned out. Dr. M. told me my blood sugar (HbA1c) and Triglycerides were too high and put me back on diabetes medication for the first time since 2009. I could have saved time and money for the office visit. For Thanksgiving I purchased a Garmin Vivofit from Amazon (product link) for just under $80. I'll cover the Good, the Bad and the Bottom Line... and endorse the product as a solid, low price, wearable fitness device - for those that walk or jog. Dashboard - Drag and Drop modules. Clean, easy to read, and simple to use. The website is very simple to use. Menus are on the left, graphics on the right, and click-down for more information. The band display is very easy to read, even without glasses, as long as you have some light. Not having to charge it daily, or weekly, is a huge win. Sync is completed via a wireless mini-USB device and takes less than 30 seconds. I sync every 2-3 days, but understand that it can hold several days of data. It's waterproof - and I have tested with showers, swimming and the hot tub. In fact, the only time I took it off was when I was cleaning the turkey. The Red Bar (no activity) feature is very motivating. The reporting feature is easy to understand. The Reports Section makes it easy to review your history. forget to set Sleep Mode or to turn off Sleep Mode in the morning. There is very little documentation (even online) to help understand how the device works - the underlying logic that is. YouTube videos for the Vivofit are mostly marketing in nature. The Sleep Tracker shows how much movement you have during the night - on a scale from Low to High, but does not offer any measure to relate to the scale. Is tossing-turning considered "low" and a walk to the bathroom "high"? It's just not clear. Some chores don't register as activity. Doing the dishes, folding laundry... if you are not moving from place to place, you don't get points. On the other hand, vacuuming and raking the yard seem to over-score. The Personalized Daily Goals (random step targets) are OK, for variety, but the Vivofit does not recognize the days of the week. My Monday calendar is typically booked with conference calls. So I have missed my Monday goal several times. My Thursday calendar is light, so I'm OK with a few more steps. There is not really a good method to set a monthly (or annual) target for steps. Again, I suspect Garmin sees daily activity as key to success, but I work on longer and larger goals. My 2.5 million step goal for 2015 is not easy to track on the Vivofit. The Garmin Vivofit has helped me get out of the house and walk. It provides (hourly) encouragement to meet daily goals, does a good job recording activity, and provides very real feedback on performance. It is very low hassle - no recharging, no removal to sync, no removal to take a shower. My first 300,000 steps were accomplished with just a bit of nagging... which is exactly what I need. P.S. The Garmin Vivofit also allows manual entry of your weight. I lost (LOST!) five pounds between Thanksgiving and New Years Day. #winning.